Some days I like Amor Amor. Other days I think it’s a soapy mess. It ultimately comes down to my mood and Amor Amor has good days more than bad days, though it’s so far the only perfume I hate one day and love the other. In Bottle: Sweet and floral, a bit sharp, with a very strong soapy undercurrent. There’s a ton of white musk in this to me. Applied: Sweet and clean with a bit of fruitiness that eventually evolves into a sweet and clean floral mid-stage. There’s something in this that’s sharp–I think it might be the white musk–that rears its head in the mid-stage and sticks around until the very end of the fragrance. 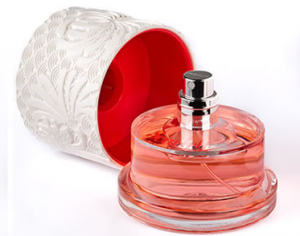 Amor Amor is a bit of fun and girly balanced with sharp clean musk. The mid-stage reminds me of a bunch of fruity florals mixed together with an extra heaping of sugar slapped into the mix. The dry down gets a bit less sweet and a bit cleaner as the white musk takes over and sweeps the fragrance into a vanilla woods with a scrubbed amber scent. Extra: I don’t know what to think of Amor Amor. Some days I think it’s one of the better fruit scents out there. Other days I think it’s just too sweet and too typical. Design: I don’t like how Amor Amor looks. It feels like it wants to be a gimmick and reminds me too much of the rose under glass in Disney’s Beauty and the Beast. The bottle itself is easy to hold and use. I just don’t care much for the aesthetics. Notes: Blackcurrant, orange, mandarin, bergamot, cassia, grapefruit, apricot, lily, jasmine, rose, white musk, amber, tonka bean, cedar. I’m writing up this review from a set of notes so I haven’t smelled Amor Amor in a while. I do wonder if my opinion of it has changed since I wrote the review. I guess I can try to smell it some time soon and see if I’m having a good Amor Amor day or a bad one. 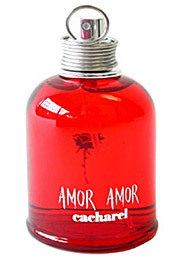 Reviewed in This Post: Amor Amor, 2007, Eau de Parfum.